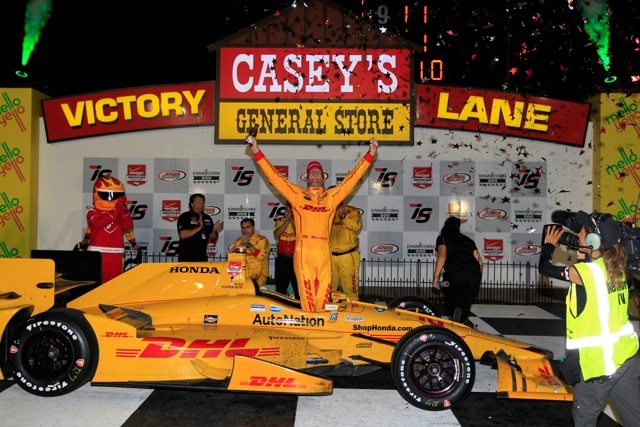 In another thrilling Iowa Corn 300, Ryan Hunter-Reay successfully defended his 2014 victory, holding off Josef Newgarden Saturday night at Iowa Speedway for his first – and Honda’s fourth – Verizon IndyCar Series win of 2015. 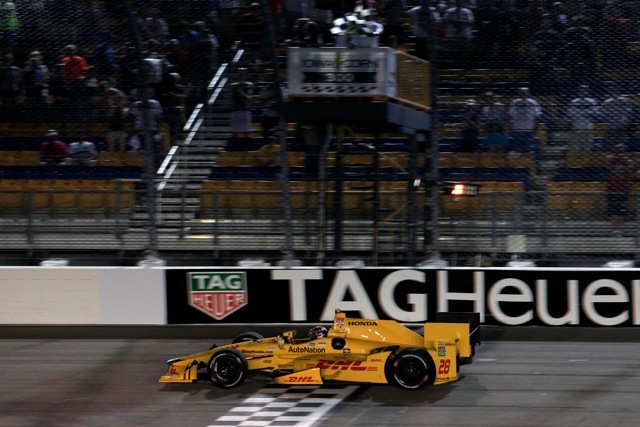 In 2014, Hunter-Reay’s Andretti Autosport team gambled on making a pit stop for fresh tires during a late-race caution, and he charged through the field for victory. But in tonight’s 300-lap run, Hunter-Reay was in contention throughout the race, and successfully battled Newgarden though the final 24 laps as the pair repeated its 1-2 finish from last year. Hunter-Reay also emerged victorious at Iowa Speedway in 2012, and his Andretti Autosport team has now won six consecutive Indy car races at the short, but very fast, Iowa oval. Graham Rahal battled through mechanical issues – including a deflating tire leading to an unscheduled pit stop on Lap 55. Falling two laps off the lead pace, Rahal also fought recurring gearbox issues, which necessitated lengthy stays in the pits and finished fourth, just 4.6 seconds behind Hunter-Reay. The effort moved Rahal to second in the drivers’ championship, 42 points behind series leader Juan Pablo Montoya. Carlos Munoz finished fifth, his best result since winning at Detroit in May, to give the Andretti team two drivers in the top five. Teammate Marco Andretti continued his run of top-10 finishes, taking the checkers in seventh. He remains the only driver in the series to complete every race lap this season. Continuing his substitute role in place of the injured James Hinchcliffe, veteran Ryan Briscoe finished eighth, equaling his previous best result of the season at Texas Motor Speedway. Video recaps from this weekend’s Honda activities in Iowa are being posted on the “Honda Racing/HPD” YouTube channel. Produced by the Carolinas Production Group, the video packages can be found in the 2015 HPD Trackside Video Playlist at: https://www.youtube.com/HondaRacingHPDTV. After back-to-back short oval races, the Verizon IndyCar Series now takes a week off before heading to Honda’s “home” road-course circuit, the Mid-Ohio Sports Car Course in Lexington, for the Honda Indy 200 on Sunday, August 2.